How do you plan to spend your retirement? Traveling the world? Endless gardening? 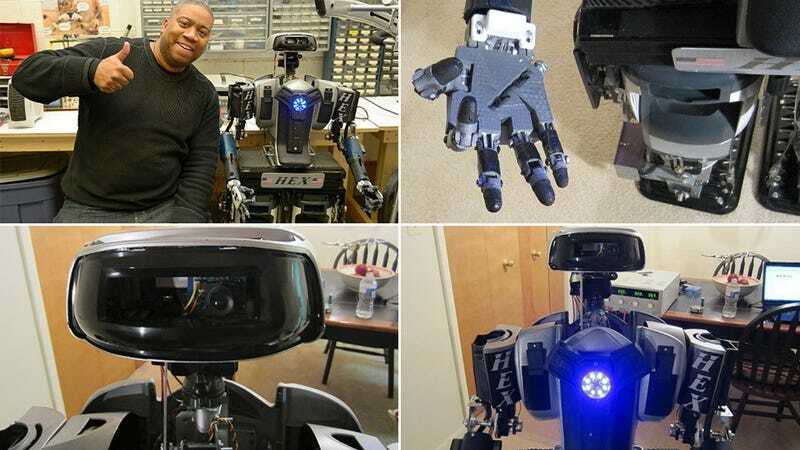 After two decades serving as a Baltimore police officer, Mark Haygood retired and now spends his free time turning old appliances like radios, DVD players, fans, and power tools into impressive humanoid robots. Mark's first creation, HEX, is a four-foot tall self-standing robot that has taken four years to engineer and so far has fully functional hands, arms, and legs. It's even able to walk, and while not completely stable just yet, that's completely forgivable when you take into account that HEX is mostly assembled from hacked appliances and other re-purposed consumer electronics.